Helena Petrovna Blavatsky (1831–91), self-styled revolutionary mystic and, years later, adopted as a New Age guru who proudly laid claim to being a “ball of contradictions,” dared her critics to view her as a minor blip on the world stage. They knew her primarily through an odd assortment of paired labels that persisted over time: occultist and mystic, charlatan and trickster, Russian noblewoman and revolutionary, cunning subversive and con-artist guru, hedonist and eccentric visionary, ventriloquist and illusionist. However, no name was more enduring than the sobriquet “Madame Blavatsky” or, to the people in her inner circle, the telegraphic “HPB” by which she was popularly known. Her disparate name-tags have endured in mainstream scholarship as obdurate descriptions of an elusive and charismatic figure who was wildly influential in her time, but whose larger-than-life reputation is now reduced to the messianic fantasies of small fringe groups. The latter characterization has made it challenging, to say the least, to give a serious reckoning of Blavatsky’s impact on the literary, philosophical, and cultural thought of the late nineteenth century, which was considerable, albeit uneven, and occasionally undermined by an impenetrable obscurity that limited her influence to her devoted acolytes. Furthermore, her self-presentation as a vessel for esoteric communications emanating from elusive “Masters,” who were purported to reside in a remote region of Tibet, only estranged her further from people outside her esoteric circle and made her more incomprehensible to them. Indeed, her arcane use of the Masters as conduits to inaccessible knowledge often undercut her historical critiques of religion in works such as Isis Unveiled (1877). If Blavatsky ended up in an esoteric niche, it was in no small part due to her abiding commitment to the Masters as ineffable sources of knowledge, obscuring her readings of religious history, which systematically took apart textual traditions in order to critique them. Blavatsky may arguably be one of the most important countercultural figures in nineteenth-century Europe, but she nonetheless remains peripheral in scholarly studies of the period, which have dispatched her to the nether regions of esoterica, where she is more closely associated with table rapping than rabble rousing. She plays much better in the popular imagination, appearing as a vivid subject in books such as Madame Blavatsky’s Baboon by Peter Washington, whose entertaining portrayal of Blavatsky as a fraud and peddler of mystical goods dwells on the eccentricities of her personality and the colorful antics of Europe’s spiritualist counterculture in the fin de siècle. Washington’s depiction of Blavatsky as a charlatan parlays the nineteenth-century investigations of her occult claims by the Society for Psychical Research (hereafter SPR) into late twentieth-century terms, treating her story as the defeat of outmoded magical practices by skeptical rationality. Blavatsky even becomes a kind of stand-in for a discredited magical worldview. The apprehension that approaching her outside an empiricist, rational framework comes perilously close to relegitimizing superseded practices partly explains the scholarly difficulties in submitting Blavatsky’s works to serious scrutiny, especially in light of her claims that she was channeling communications from the Masters, who, she insisted, were the true authors of her numerous writings. In his compelling work on the complexities of writing about the paranormal, Jeffrey Kripal captures the problems in shutting out what cannot be permitted into our rationally ordered schemas, all the while recognizing the conceptual difficulty inherent in the task: “How, after all, can one have an experience beyond matter in a worldview that claims that there is nothing outside of matter? And how can one step out of a worldview that says one cannot step out of a worldview?” Kripal goes on to discuss the work of Harvard psychoanalyst John E. Mack, who became interested in ufology after working with clinical patients claiming to have been abducted by aliens. To illustrate the scholar’s predicament, Kripal cites Mack’s 1992 lecture at a Massachusetts Institute of Technology conference on experiences of alien abduction, as quoted by Barry Windsor-Smith: “You can’t get there from here without a shift in our worldview—a worldview that contains a ‘we’re here and you’re there’ sense of separateness in which the physical world is all that exists. . . . In other words, you can’t deal with something such as the [alien] abduction phenomenon that is so shattering to our literalist, materialist world-view and then try to understand it from a literalist, materialist world-view!” Similarly, the conundrum of trying to understand supersensible phenomena from a standpoint that upholds different standards of proof partially accounts for the difficulties in approaching Blavatsky from outside the esoteric register. Not making it any easier for her critics, Blavatsky participated in her own self-exile. In her customary ironic mode, she helped to convey a picture of herself as an untenable set of contradictions that laid bare the “chaos of impossibilities” in the modern era, extending far beyond a crisis of faith. The skepticism that she mockingly described as a bump on her skull, fingered by a perplexed phrenologist, coexisted neatly with equally large “lumps” of belief, and Blavatsky deliberately loaded both terms—skepticism and belief—with new meanings that left the science versus faith debate flat and one-dimensional. Blavatsky picked up on a key understanding of science—that it creates systems of meaning about unseen phenomena—in order to claim that her method was closer to science than to the history of religions. Religion treats the unseen as if it has already been experienced and seen in a unique mystical event, whose visionary insight is transmitted through teachings and texts. Science, on the other hand, depends on imagining the unseen in another space and time, prior to experience. In distinguishing between science and religion in these terms, Blavatsky aligned occultism more closely with science than with religion. Partly her move aimed to give greater respectability to occultism, but she also sought to detach religion from the core of transcendental experiences and so to redefine its modern expression as a form of occultism that collapsed distinctions between mind and matter. Molding her personality ostensibly to the demands of science, she turned herself literally into a medium for the articulation of modernity’s search for new answers to old questions. The view that Blavatsky outpaced her times, held by occultists like Denis Saurat, painted her as a romantic rebel and revolutionary, more akin to William Blake than to Éliphas Lévi. Her modernity can be more aptly placed in perspective when viewed through the lens of a clash between reason and religion. Wouter Hanegraaff has convincingly argued that secular modernity provided a context for the emergence of occultism, which can be understood, in his view, as “the attempt by esotericists to come to terms with a disenchanted world, from the perspective of a disenchanted secular world.” Speaking to and from a disenchanted world, Blavatsky, in her attempts to find a common ground between science’s pursuit of the unseen and occult studies, epitomized the contradictions opened up by the secularizing rationality of her time. A wide spectrum of intellectuals, writers, and artists were drawn to the organization she cofounded in 1875—the Theosophical Society—partly because secular rationalism failed to meet their spiritual needs, and in equal measure due to the failures of religion to do likewise. In response to the limitations of both rationalism and religion, these seekers turned to so-called fringe movements for answers to questions about matter and mind that went beyond the confines of either science or religion. The Theosophical Society emerged from the parlor rooms of Blavatsky and her spiritual partner Henry Steel Olcott (1832–1907) and quickly became a magnet for an eclectic group of people who were not only interested in the nature of psychic phenomena but also actively sought their roots in antiquity. A lecture in New York by G. H. Felt on September 7, 1875, “The Lost Canon of Proportion of the Egyptians,” incited such avid interest that it resulted in the decision to form a society for the study of occult philosophies from antiquity to the present age. Blavatsky went so far as to claim that the organization’s origins were occult in nature, insisting that astral communications from remote spiritual adepts had directed her to form the Theosophical Society, by means of which their wisdom teachings would be disseminated to the world at large. In an effort to create an aura around the Theosophical Society as an enchanted organization, Blavatsky sought in equal measure to minimize her own role as author and to privilege mediumship as the engine of esoteric insights. While Olcott wrote newspaper articles on spiritualism that familiarized the American public with unusual activities involving mediums and séances in upstate New York and Vermont, Blavatsky boasted that she possessed the power to produce the psychic phenomena on which he reported, declaring that her abilities represented true spiritualism, in contrast to the chicanery exposed in Olcott’s reporting. 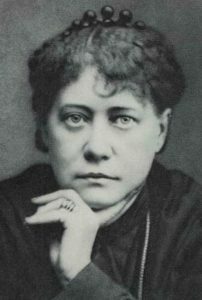 Blavatsky’s effort to distance herself from theatrical spectacle and affiliate her mediumship to spiritualism’s roots in the secret teachings of the adepts, however, was far from successful in those early years, and she remained under a cloud of suspicion that led to lengthy investigation by the SPR. Theosophy, the philosophy espoused by the Theosophical Society, was a cosmopolitan movement that acquired adherents around the world, where it flourished independently and had a life beyond the society. Theosophy developed in reaction to orthodox Christianity, seeking the roots of spiritual life not in dogma but in an experiential religion recapturing a non-deity-centered, pantheistic theology. Its appeal lay in finding a common ground between many world religions, without necessarily subscribing to the tenets of any one particular faith. Theosophy and other occult movements played a major role in the crisis of culture and conscience in fin-de-siècle Europe, reflecting changes in the status of not only science but also Christianity. Theosophy gained some legitimacy in scholarly circles because it was helping to make available Eastern texts at around the same time that Western scholars were researching Hindu and Buddhist literature. However, unlike other countercultural movements that became part of the mainstream, Theosophy remained at the fringes and was perceived as too enveloped in arcane symbolism and wild sleights of hand to be anything more than an eccentric movement. Yet, despite being at odds with the prevailing worldview and establishment culture, Theosophy was part of a broad search for a new world conception, exploring psychic and spiritual states that defied rational, positivist comprehension. In Theosophy artists and intellectuals found a new vocabulary for discussing topics that could no longer be discussed in the existing terminology of theology or science, although this did not mean that thinkers who were drawn to Theosophy necessarily stayed with the movement. Some in fact, like George Bernard Shaw, turned fiercely antagonistic. But for painters like Wassily Kandinsky and Piet Mondrian and poets like James Cousins, Æ (George William Russell), and W. B. Yeats, Theosophy contained a cache of imagery that helped them move far beyond the limiting Kantian categories of time, space, and causality. From such images they could develop a nonrepresentational abstract art to convey spiritual and psychic realities that remained unseen and unknown, bringing into play the insights of science to explicate living organisms that remained invisible to the human eye. Widely considered to be one of the most influential occultists of modern times, Helena Petrovna Blavatsky (1831–91) was equally a cultural critic and theorist of religion. This essay examines Blavatsky’s reading practices and the interpretive protocols she followed in challenging the hegemony of certain knowledge structures, whose origin she located in religious orthodoxy. Her extensive writings emphasized that skepticism has its source not only in modern science but also in the heterodox religious philosophies banished or superseded by doctrinal religion. A key point of her critique was that dominant religions consigned competing theories of the world to oblivion by denouncing them as heresies or blasphemies. These so-called heresies were, for her, lost or esoteric knowledge, just as magic was a placeholder for religious debates erased from the historical record. Maintaining that the dislocated past can only be salvaged by nonrational experiences, Blavatsky shifted the weight of truth from the exoteric to the esoteric, thereby creating a space for the recovery of core meanings through such eclectic means as memory, imagination, and the paranormal faculties. GAURI VISWANATHAN is Class of 1933 Professor of English and Comparative Literature and Director of the South Asia Institute at Columbia University. She is the author of Masks of Conquest: Literary Study and British Rule in India (Columbia University Press, 1989; 25th anniversary edition, 2014) and Outside the Fold: Conversion, Modernity, and Belief (Princeton University Press, 1998). Her current work is on genealogies of secularism and the writing of alternative religious histories.